Birthdays and fireworks, what a fun way to celebrate! 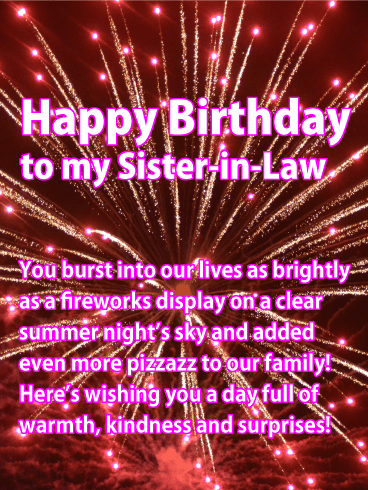 Let your lovely sister-in-law know you remembered her big day by sending her this exciting happy birthday card covered in colorful, exploding fireworks! This greeting will have her bursting with excitement and feeling the familial love! Once she sees this birthday card she'll likely spend the rest of her special day glowing with happiness! 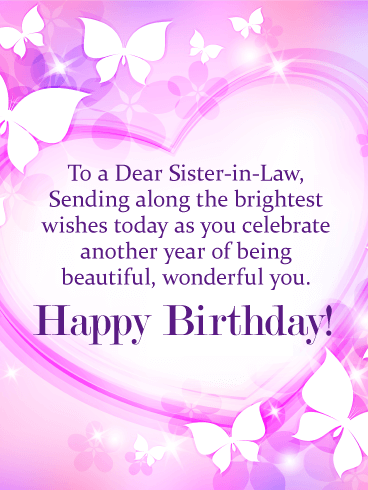 To that cheerful, always polite, darling, dear, and such a treat Sister-in-law. Like candy on a holiday, she's a delight. 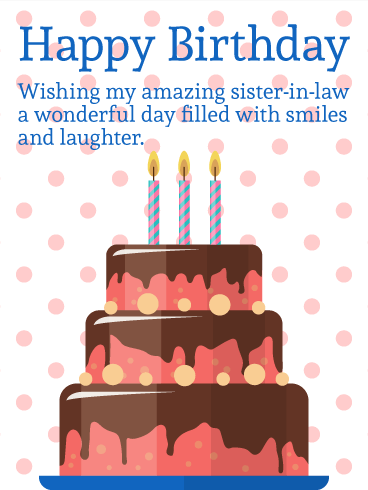 The Sweet as Candy Birthday Card is for the Sister-in-law who is unflappably perky or unstoppably funny. 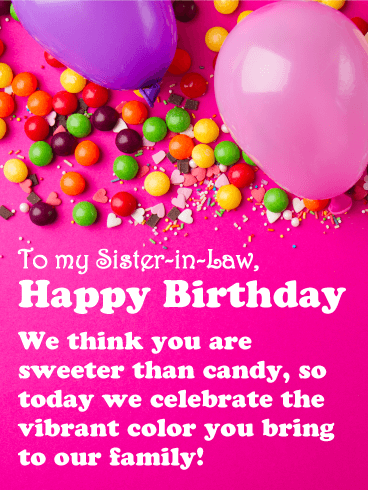 Whether sour with snark, or tart with sass, sending this candy coated gem of a card is sure to be a sugar-spun blast! If popularity were an election, she'd win in a landslide of perfection! Hoist the balloons and string the banners, let us celebrate her charming manner! 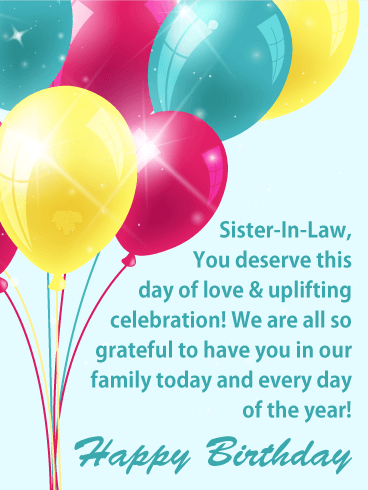 Whether she's your partner's sister, or your sibling's wife, you're glad your sister-in-law is in your life! 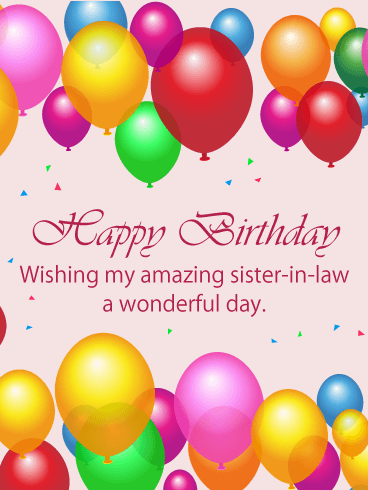 Show her you're both proud and glad she's here to stay with this happy card on her birthday! Your sister-in-law is a warm person, a bright, shining beacon capable of leading others out of darkness. 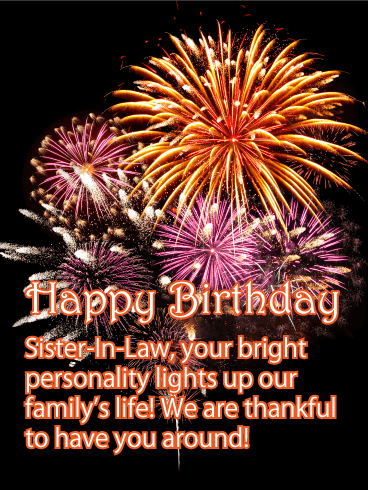 This birthday, consider sending her a cute, lit candle-festooned card that will assure her you have noticed her guiding light and have her back 100%! 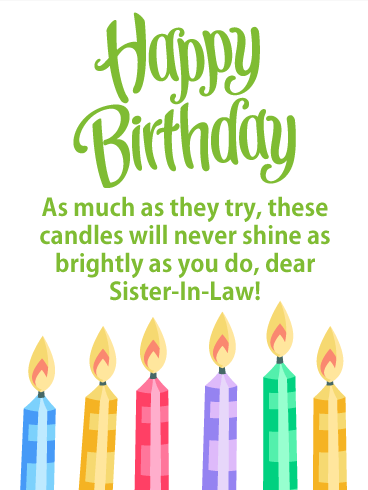 Wish her well with this bright candles birthday card done in soft greens, pretty pinks, youthful yellows and brilliant blues! Variety is the spice of life! If everybody was the exact same, things would be so dull! 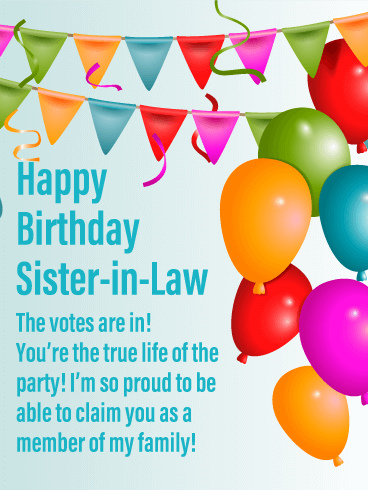 Send your amazing sister-in-law this balloon-filled birthday card for her special day! Its heartfelt message will reassure her of how appreciated her position in the family is! Her positive existence brings extra energy and enthusiasm to the family and you love her for it! Once again it is your wonderful sister-in-law's birthday and you want to play the celebrated role of Marie Antoinette! "Let them eat cake" you shout to the world by sending her this decadent layer cake birthday card! Tell her to cut loose and enjoy the day her own unique way with this explosion of presents, balloons, and stars over a pink background! Birthdays are for indulging after all! Does your sister-in-law love glitter? How about the color pink? Is she something of a diva, or maybe just has a flair for the dramatic? If you answered "yes!" to any of those questions then you've just got to send her this glittery birthday cake card for her big day! She sparkles, she shines, and you need to celebrate her boldly! Your entire family loves any excuse to gather together and party it up! When you gained a new sister-in-law your whole unit also got a brand new, yearly-occurring reason to throw yet another relatives shindig! Tell Mom to get baking, tell Uncle to bust out the video camera, and maybe Granny will make her famous potato salad! 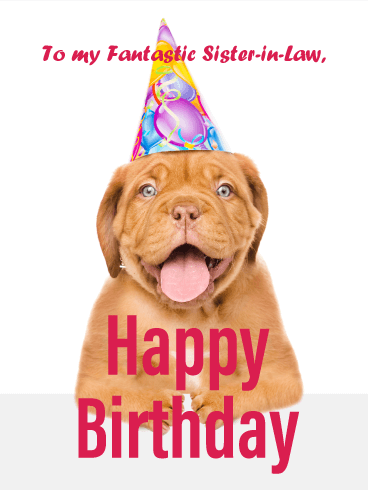 Let that good-livin' gal know how much she's appreciated in your circle by sending this party candles happy birthday card! Which is more important: presents or presence? 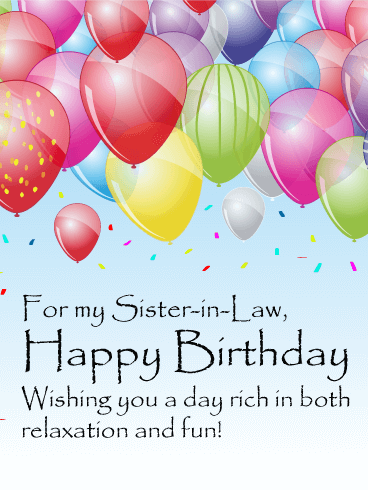 By sending this precious gifts happy birthday card to your cherished sister-in-law you will be letting her know how much her presence in the extended family means to you! She's a gift that keeps on giving and you want her to accumulate many more joyful memories with all of you! Keep the good times rolling! Does your beautiful sister-in-law inspire you to poetry? 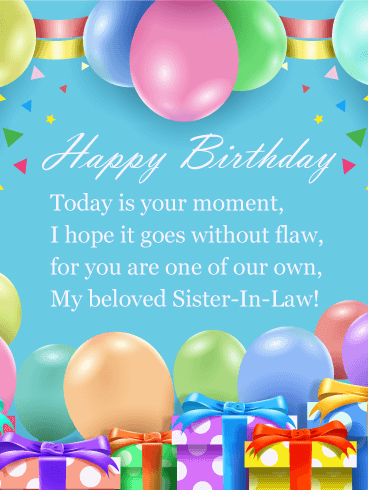 Even if you aren't much of a poet yourself, or don't have any time on your hands to craft a sonnet, let us do the smooth-talking for you and simply hit send on this beloved poem happy birthday card! This little rhyme is sure to make her feel loved by, not only you, but the entire family! Party Dog has spoken and we're good listeners. 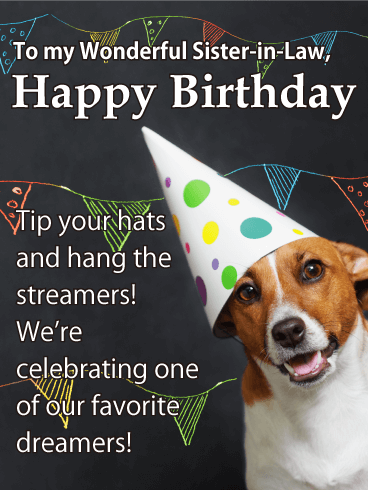 This bright eyed pup in his jaunty party hat is clearly an expert on fetching good times! He wants to tell your sister-in-law happy birthday, and thanks for being the person she is, so what are you waiting for? 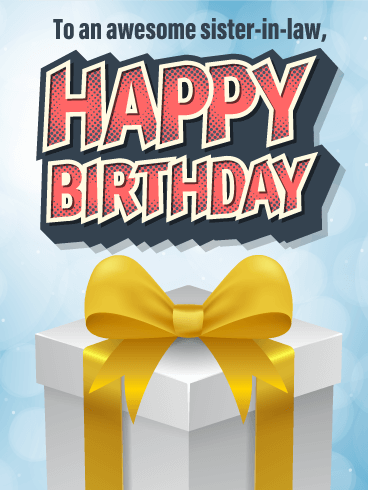 Send this card now! That wonderful human being deserves it and she shouldn't have to "beg" you to remember her birthday! 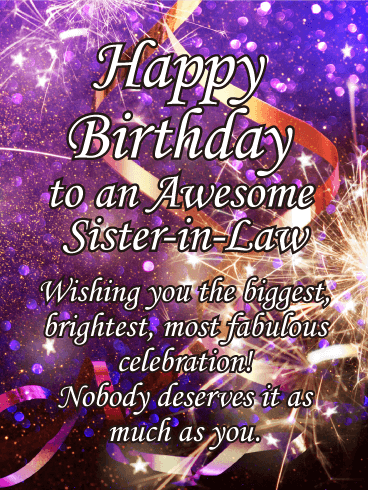 This birthday card for an amazing sister-in-law has "celebration" written all over it! From the bunches of balloons in the background to the big, bold words front & center, it's the best way to make her feel like she's floating on air all day long...and for a long time to come! It feels like a gift to have her as a sister-in-law. 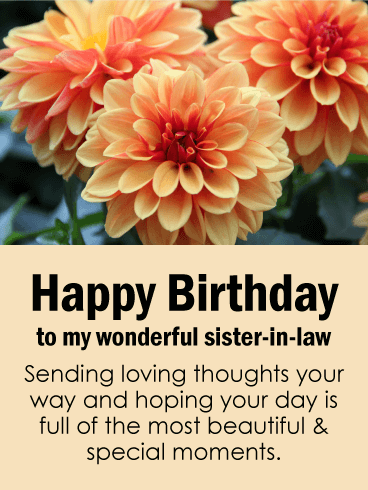 So when her birthday comes around, tell her how you feel with this thoughtful and beautiful birthday card. 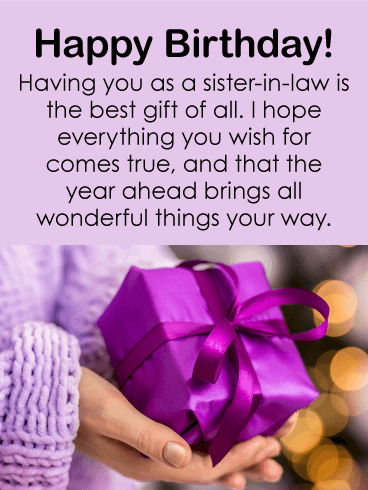 Two hands holding a bright purple present, wrapped up in a bow, are bringing lots of special wishes her way, while the lovely sentiment above will continue to fill her with love & happiness on her big day. 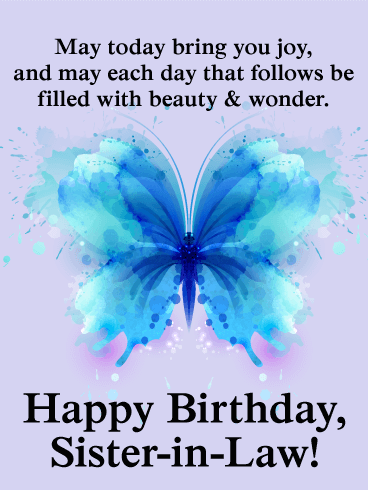 This lovely birthday card, featuring a big, bright butterfly, will send your sister-in-law's spirits soaring on her birthday! 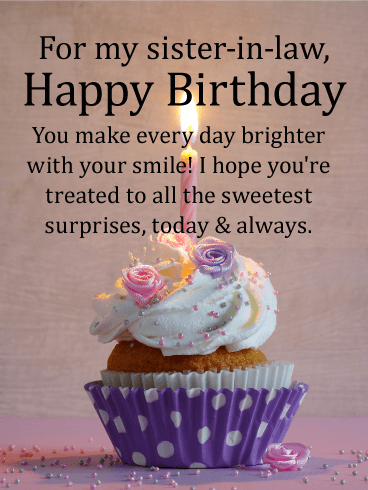 It's a thoughtful way to wish her joy and happiness as she celebrates this special day, while also letting her know that you're hoping her days ahead are filled with beauty and wonder. 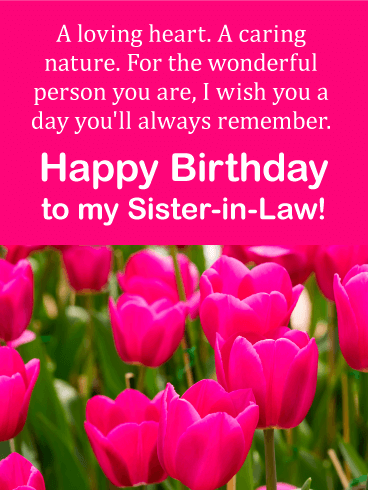 This bright and festive birthday card is a wonderful way to celebrate a special sister-in-law on her birthday! A colorful, candle-topped cake is waiting for her to make a wish, and it's joined by your own wishes for her, today and in the year ahead. What a sweet greeting to send when you want to make her smile and feel remembered. There's nothing sweeter on someone's birthday than making them feel happy. 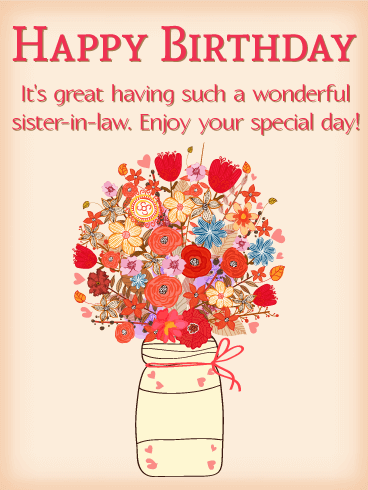 And this colorful birthday card is sure to have your sister-in-law feeling the love! A delicious purple cupcake, with bright candles sticking out all around, is a special treat to surprise her with. 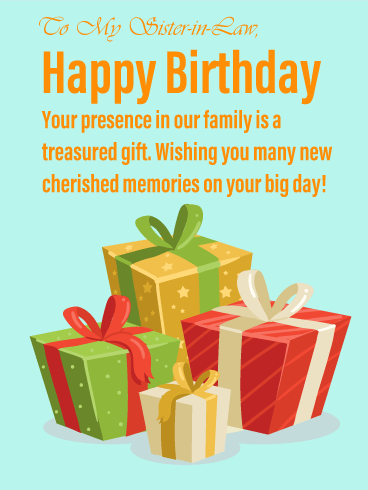 And what makes this birthday card even more special is your warm and heartfelt sentiment to such a wonderful family member. Do you have a sister-in-law who loves the beautiful things in life? Then this gorgeous birthday card is for her! 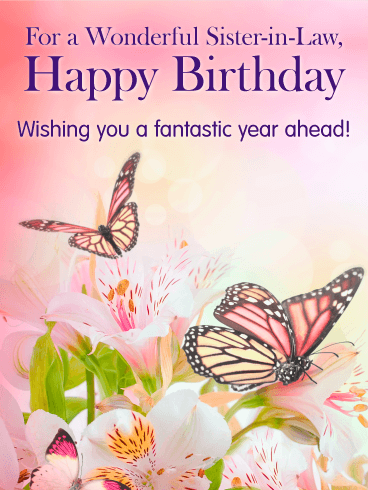 A pink color palette with pretty butterflies and flowers grace this happy birthday card, and a simple warm message expresses your love and best wishes. 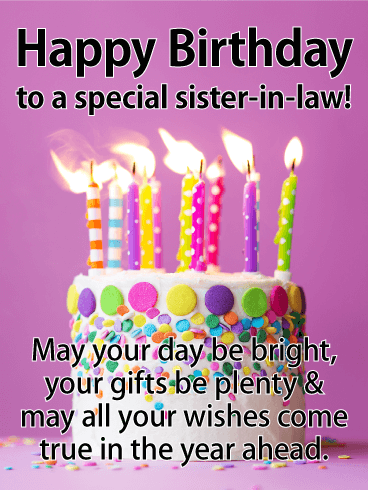 Your sister-in-law will be delighted to receive this beautiful happy birthday card on her special day. 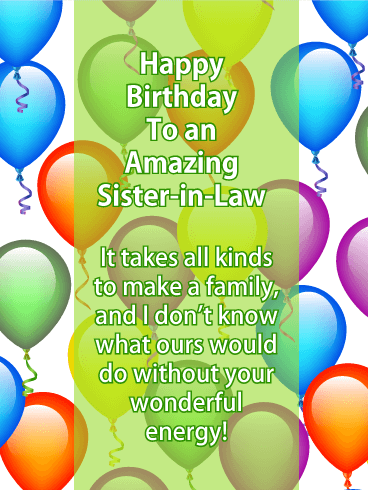 The message takes center stage on this lovely birthday card for a special sister-in-law. 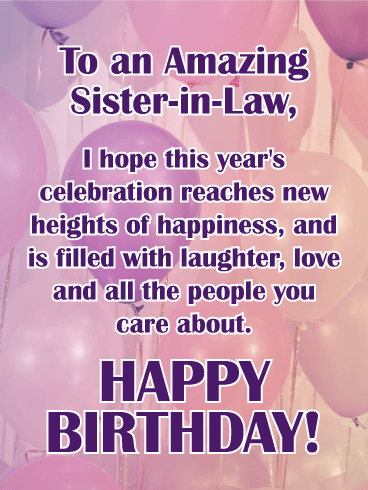 If you have a sister-in-law you love dearly, who brings joy and happiness to others, then this is the birthday card for you to choose. Pink tones and images of butterflies, flowers, and sparkling bubbles give this pretty birthday card a very feminine air. 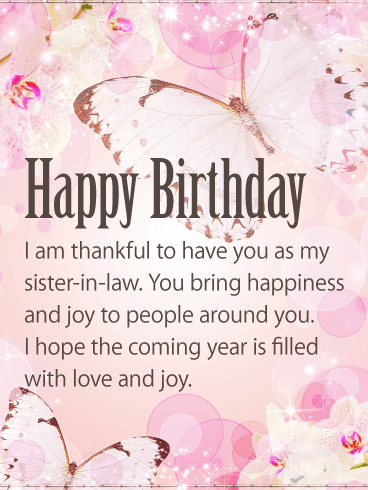 Your dear sister-in-law will be touched by this heartfelt message on her birthday. 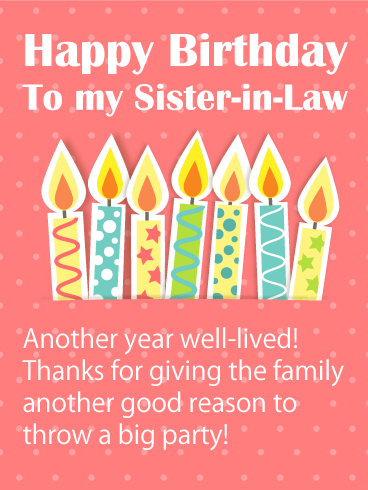 This cheerful birthday card is perfect for a youthful sister-in-law. 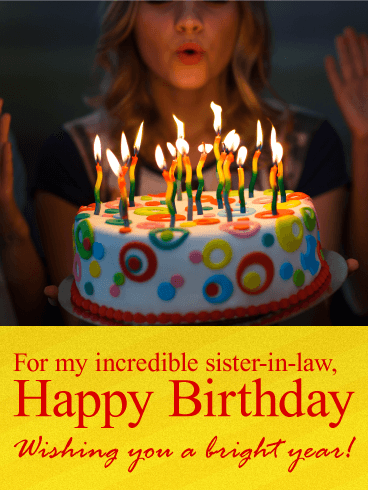 Featuring a hip birthday cake with fondant swirls in primary colors and squiggly rainbow candles, this card is the very image of the best kind of birthday celebration! 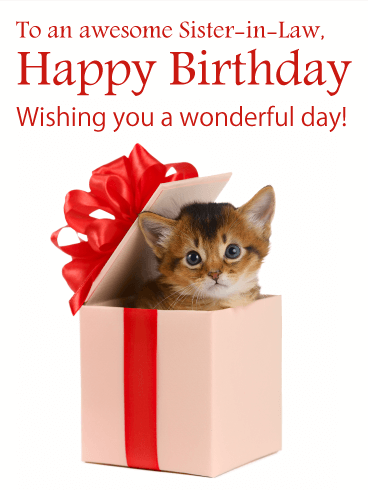 Combined with its modern, light-hearted message, this birthday card will warm the heart of any young woman. 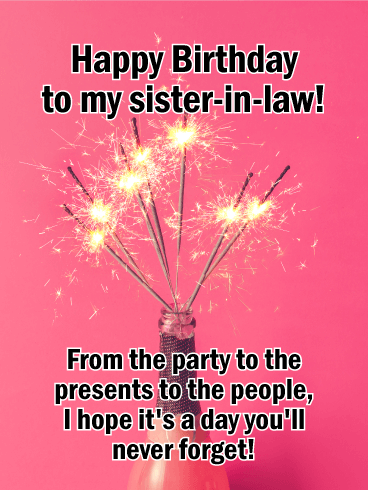 Your sister-in-law will be delighted to receive this fabulous happy birthday card from you! 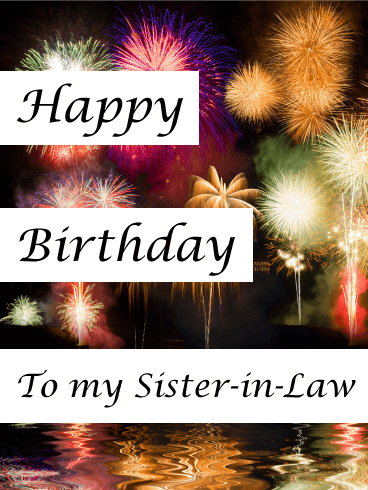 This cute birthday card will delight your sister-in-law! 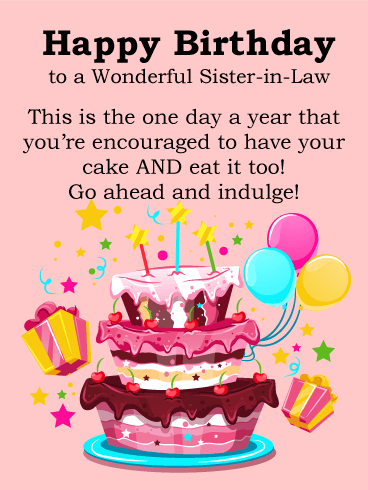 Featuring a luscious three-layer cake with pink and chocolate icing, and with polka dots on the cake and the background, this adorable birthday card is endearing and sweet. 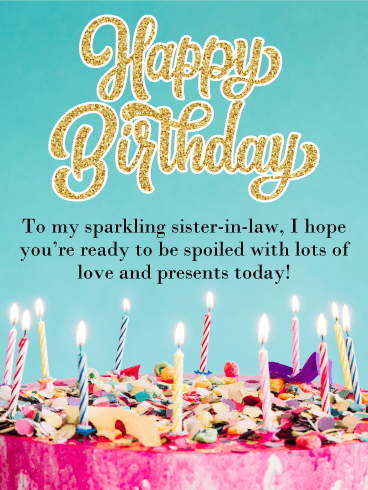 If you have a charming, amazing sister-in-law who you love dearly, then remember her special day in a special way with this pretty happy birthday card!